Bask in the warm sun and cool breezes, enjoy brisk walks on the beach, and share the golden sunsets! 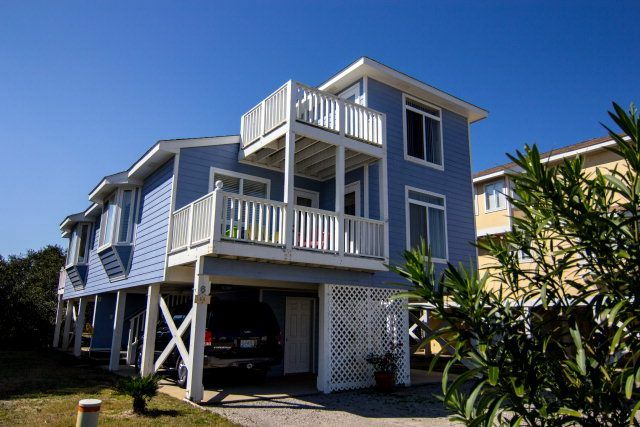 Southern Delight Duplex is located in family-friendly Gulf Shores Plantation - a quiet secure gated Gulf Front Resort. The Robert Trent Jones Kiva Dunes Golf Course is right behind this beach cottage. This cottage is directly across from a beautiful Courtyard with 2 outdoor pools, a hot tub gazebo, pool cabana, and a short boardwalk to the beach. Bring the whole family! Each unit has 3 bedrooms and 2 bathrooms plus spacious living area and fully furnished kitchen with full-size appliances. Book the Whole Cottage! Need more room for your extended family - rent both sides and have 6 bedrooms, 4 bathrooms, 2 living areas and 2 back-to-back kitchens with connecting doors between kitchens and upstairs halls. Unit B is vrbo listing 492882 under Plantation West. Beach and Gulf View from decks on 2 levels and from dining area bay window. New deck furniture on lower deck. Main floor has living area, kitchen, and downstairs master bedroom with bath and king-size bed. Upstairs is another Master bedroom and bath with queen bed plus 3rd bedroom with twin beds. All rooms professionally decorated with tropical furniture and beach décor. Luxury linens on all the beds. The resort has 6 outdoor pools, 1 indoor pool and sauna, and several hot tubs. Beach chairs provided in guest storage. Owners are Larry and Peggy Adams. Larry is a college professer at a north Alabama University. Peggy is a retired rocket scientist. We both love the beach! Buying this property will enable us to spend a lot of time at the beach with our family, spend some quiet time there in the Fall and Winter after retirement, and also give us a great rental property. Southern Delight is more private than a condo, has great beach and gulf views, has private parking, is located in a resort with great amenities, and is next door to Kiva Dunes Golf Resort. 8 sets of towels provided. Guests must launder towels during your stay. Complete set of dishes and flatware for 8 plus serving dishes and cookware. Grass on each side of the duplex. Lush courtyard by the pools. No boat provided, but there is a day use boat launch in the bay across the road from the resort. This is a raised beach cottage so there is not access for wheelchairs. Enjoy all the resort amenities and ocean breezes. Play golf at Kiva Dunes. Don't feel like cooking - visit on-site Sassy Bass Snack Bar or Kiva Dunes Bar and Grill. Connections serves Starbucks coffee, breakfast items, sandwiches, and drinks. Kiva Dunes Grill serves breakfast, lunch, early dinner, and drinks. We enjoyed our stay. Plenty of room for our group of 5. Peggy was quick to respond to any questions we had. There is a great view of the pool area and distant beach from the dining area. The rental has a storage area with tons of beach toys and floats. We would stay in this rental again on future trips! Our first trip to Gulf shores 5 adults and 2 kids. This property was absolutely amazing. We will definitely be back. Peggy was great to work with and the house was just what we needed! Perfect location with beautiful beach view, walk to the beach access was very quick and easy. Ice machine, pools, hot tub on site made it even better! Grounds where excellent - Cottage was near 2 awesome Pools, Jacuzzi and Beach and a couple of good grills. Loved the walkways across the dunes,. Had an enjoyable stay. Owner very responsive. Great overall experience. Unit was as described and was a clean and comfortable place to stay. Convenient to the beach and pools, easy to get into. The place had comfortable bedrooms and all the needed amenities. We really couldn't figure out the TV's so you may ask for instructions about that, but you don't really need them anyway after the beach all day, you either sit on the balcony and relax or fall asleep. Host was responsive. Overall wonderful stay and I would rent again. Enjoy all the resort amenities and ocean breezes; Take Fort Morgan Ferry to Dauphin Island; Enjoy Dauphin Watch Cruises, Deep-Sea Fishing, or Charter Fishing; Shop at Tanger Outlet Mall; Spend a day at the Water Parks or Gulf Shores Zoo; The Air and Space Museum at Pensacola Naval Base is a great day trip for the entire family if it rains (and it's FREE! ); Don't miss the local seafood restaurants! The minimum age to rent the unit is 25 years old. No pets are allowed in the unit or the GSP resort. A 25 percent premium may apply for holiday weekends.